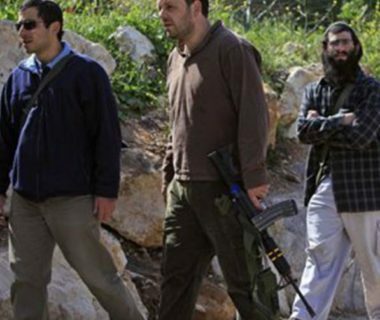 A number of extremist illegal Israeli colonialist settlers attacked, on Friday evening, two Palestinians in the Salaima neighborhood in Hebron city, in the southern part of the occupied West Bank. Eyewitnesses said the assailants attacked the two Palestinians in their neighborhood, near the Ibrahimi Mosque, causing various cuts and bruises. They added that the colonists also attacked several shops in the same area before Israeli soldiers invaded it, and forced all Palestinian shops to close, in addition to firing concussion grenades and gas bombs at many residents. A local Palestinian, identified as Sameeh Da’na, said the soldiers invaded his home, and installed a tent on its rooftop to use it as a monitoring tower. The soldiers also installed several roadblocks, in addition to increasing their deployment in the neighborhoods of the Old City. Several Palestinians were injured by live bullets or sustained suffocation from teargas inhalation on Friday, as Israeli forces attacked the Great March of Return protests at Gaza-Israel border, the Health Ministry in Gaza has reported.. The forces fired live bullets and rubber-coated steel rounds at the protesters who gathered at many encampments along the border, in commemoration the 101st anniversary of the Balfour Declaration. Many of the protesters were injured, some seriously. 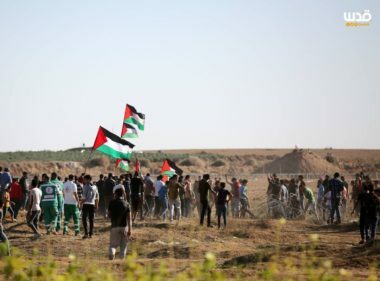 The Health Ministry said the soldiers shot four Palestinians with live fire near the perimeter fence, east of Gaza city, before they were rushed to a local hospital, and added that many others suffered the effects of teargas inhalation. Three Palestinians were also shot with live fire east of Khan Younis, in the southern part of the Gaza Strip, and were rushed to Nasser hospital, while many others suffered the effects of teargas inhalation. The Ministry also said the soldiers shot three Palestinians with live fire, and caused many others to suffer the effects of teargas inhalation, east of Jabalia in northern Gaza. The wounded Palestinians were moved to the Indonesian hospital in nearby Beit Lahia. Many Palestinians suffered the effects of teargas inhalation, east of the al-Boreij refugee camp, in central Gaza, and east of Rafah, in the southern part of the coastal region. More than 204 Palestinians have been killed and thousands of others injured, since the outbreak of the Gaza border protests on March 30. The protests call for ending the 12-year-long Israeli blockade of Gaza and for the right of return of the refugees. Most of the casualties occurred on May 14, when Israeli forces attacked Palestinian protesters marking the 70th anniversary of Israel’s occupation of historical Palestine and the ensuing ethnic cleansing of half a million Palestinian refugees. Palestinian medical sources have reported, Saturday, that a child died from serious wounds he suffered after the army fired a missile at his home, during the Israeli war in the Gaza Strip, in the summer of 2014. 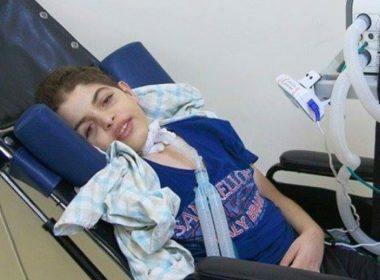 The Al-Wafa’ Rehabilitation Hospital said the child Mohammad Nasr al-Reefy, 14, was seriously injured, on August 21, 2014, to several parts of his body, especially his spine, resulting in quadriplegia and various health complications. The child was injured in mainly in his neck and head when the Israeli army fired a missile at the family’s farmland, in the Tuffah neighborhood, in Gaza city. 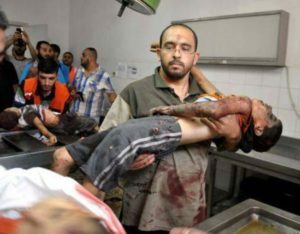 The Israeli missile instantly killed the child’s brother Omar Nasr Ziad ar-Reefy, 4, and their father Nasr Ziad ar-Reefy, 37. The Al-Mezan Center for Human Rights has reported that, on Thursday morning August 21st, 2014, an Israeli war jet filed a missile at a farmland owned by ar-Reefy family, near the an-Nafaq Street, north of Gaza city, killing five members of the family, including three children, and wounding four, including two children, identified as Maram ar-Reefi, and Ziad Tareq ar-Reefy, 9, who later died from his wounds. It said the soldiers killed Ahmad Tareq ar-Reefy, Mohammad Tareq ar-Reefy, 13, Abdullah Tareq ar-Reefy, 6, and Mohammad Ziad Abed-Rabbo ar-Reefy, 28, and injured dozens, many of them seriously. A few hours later, the army fired a missile into Sheikh Radwan Graveyard, north of Gaza city, killing four graveyard workers and caretakers, identified as Abdul-Rahim Talal Shweikh, 22, Rami Hamdi Salem, 20, Mohammad Hamdi Salem, 18, and Awsam Talal Shweikh, 45, in addition to seriously wounded Salem Abu Ghaddayeen, 28. The Al-Mezan Center for Human Rights said the soldiers killed at least 2218 Palestinians during the 51-day Israeli offensive on the coastal region, while dozens later died from their serious wounds. Around %72-84 of the slain Palestinians were civilians, including hundreds of children. Al-Mezan stated that the Israeli bombardment and shelling of Palestinian homes, residential buildings and structures, resulted in wiping out entire families, while dozens of families lost multiple members. According to UN OCHA, 142 families lost 3 members or more, killed by the Israeli attacks.